If you want to take your event presence to the next level, nothing will do it like our inflatable items. Tents, arches, columns or seats. Every item is extremely durable and built to last. Custom printed with dye sublimation print which can be printed on every surface area for a truly custom look. Inflatable Arches are perfect for Triathlons, Races, Marathons, Sponsorship's, Charity Events and exhibitions. They are often versatile and can serve multiple purposes depending on what your needs are at that specific time. 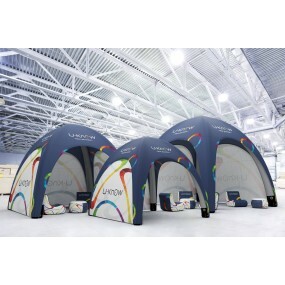 Every Arch features your own design and branding to provide your participants with a lasting impression of your event. Inflatable arch’s are light weight and can be easily set up, dismantled and carried away. They have become such a big hit, designed to last many years and are one of the most cost effective ways to promote your event. We can accommodate you with artwork design, so let us work with you to make a lasting impression on your events. Inflatable arches are the best way to start and finish your event.